If you have spent time on Long Island Sound this summer, especially between Rye, New York and Old Saybrook, Connecticut, perhaps you’ve spotted black patches of water among a sea of blue. At closer inspection the dark, nervous water may have appeared moving or boiling with splashes. This is the scene I’ve been witnessing every day for two months on my commute to work along I-95 in New Haven. These dark patches of water are schools of large baitfish called Atlantic menhaden, also known as bunker or pogies depending where you live. 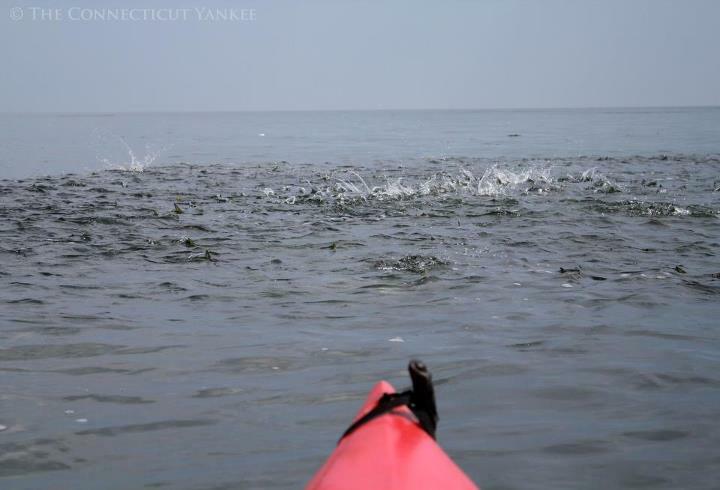 These silver fish with black spots visit Long Island Sound each year usually around early May, sometimes staying in or around our harbors through October. Some years we see better numbers of bunker in the Sound than others and this seems to be one of them. Just ask fishermen and bait shops up and down the shoreline and they’ll tell you with a grin that it’s been a good year so far for the baitfish, which in turn draw in predators like bluefish and striped bass that saltwater anglers love to catch. The author H. Bruce Franklin was spot on when he titled his book about menhaden , The Most Important Fish in the Sea. Menhaden make up the foundation of the Atlantic Ocean food chain. So many creatures along the Eastern Coast depend on this oily forage fish, from marine mammals to birds to sea turtles to bigger fish. In addition to their important role in the food chain, menhaden are filter feeders and act as natural filters for the ocean ecosystem. Menhaden are also valuable to humans and this, unfortunately, has led to overfishing. Although the commercial harvesting of menhaden is not allowed here in the Sound, this is a huge industry in the Mid-Atlantic States, where they are used for various things like omega-3 fish pills, pet food, and livestock feed. Save the Sound and many other environmental groups signed-on a letter last November urging the Atlantic State Marine Fisheries Commission (ASMFC) to take action to rebuild menhaden populations by reducing coast-wide catch limits. ASMFC listened and voted in favor of an overall 37 percent reduction in menhaden harvest starting in 2013. The decision last November was a big win for menhaden and for all the marine life and wildlife that depend on them. Hopefully this will allow menhaden populations to again rebound to sustainable levels, which will mean more years like this one in Long Island Sound’s future. Posted by Kierran Broatch, outreach associate for CFE/Save the Sound and an avid fisherman. 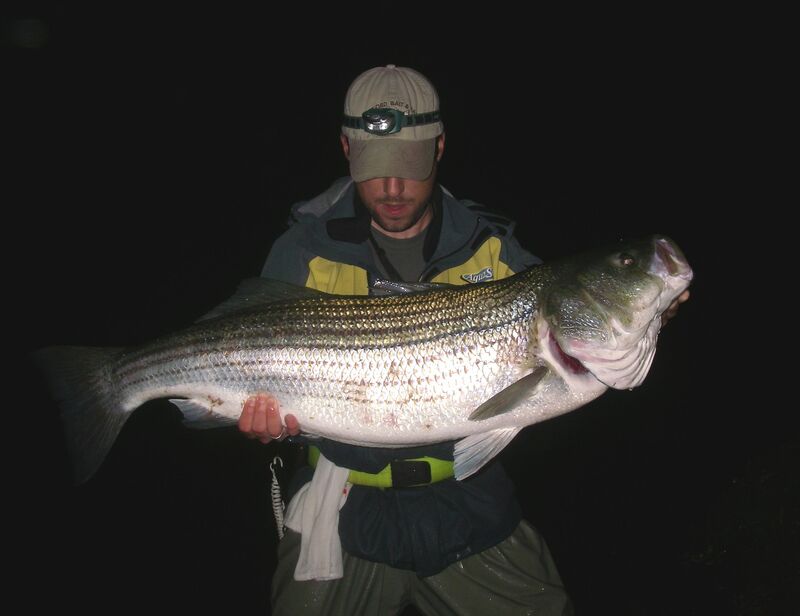 Read more about fishing on Kierran’s blog, The Connecticut Yankee. There is less than 1% of the east coast menhaden stock’s B zero or unfished biomass remaining in the waters of the east coast. 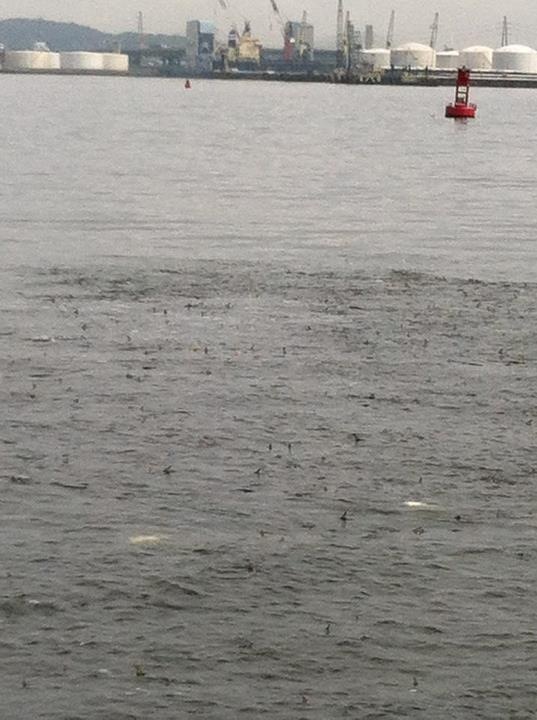 Schools of menhaden should be miles long and a half mile thick…. These animals are the keystone species of our food web here. You are seeing small ” patches” of what remains of the stock. What remains after many decades of industrial overfishing and mismagement is not nearly enough to support a health community of organisms from blue whales to blue claw crabs which depend on this biomass. I would curb my enthusiasm and start looking at the facts.